» Lack of Integration. For all of their sophistication, many of today’s Smart Home technologies are direct descendants of the traditional cellular telephony model where each device acts in a “hub and spoke” system. The inability of today’s popular Smart Home systems to interoperate and perform well with heterogeneous [multi-vendor] devices and environments is a significant obstacle to wide-spread adoption of these systems. What happens when you also want remote awareness of your electric garage door, your stove, your hot water heater, or your lighting system? Would you want separate connections and proprietary interfaces for all these things? How many user manuals do you really want to read? » Poor User Experience. The lack of interoperability has a direct and distinct impact on user experience. From a technical perspective, consumers desire ease of use and seamlessness across platforms and services. 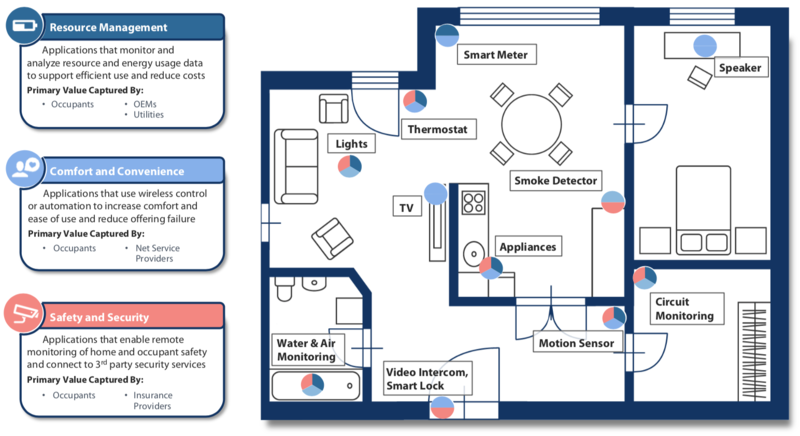 When consumers have to use dozens of different applications to control each of their connected devices, the user experience of one device is muddled by the experience of the disjointed nature of the entire Smart Home experience. Further, consumer commitment to an isolated system or device is risky in the current fragmented residential market. As exemplified by Nest’s recent announcement that it will discontinue support for the Revolv Smart Home hub in 2016 (Nest acquired Revolv in 2014). Revolv customers who had connected all of their devices to the hub are now simply out of luck; not only is the product no longer supported, it will no longer function. This event and others like it are forcing consumers to think twice about the Smart Home products they are buying, or think twice about buying any smart home products at all until user experience is improved. » Limited Functionality & Value-Added Services. For the most part, manufacturers are not thinking about user experience relative to all the connected devices in users’ homes; instead, they’re thinking only considering consumers using their devices, but without the context of the network and the product in use relative to other peer devices. Players who want to encourage market development need to consider the opportunity to sell elegant and unobtrusive—sometimes even invisible—networked service experiences. This will often mean de-emphasizing products per se, which is an understandably difficult thing for product companies to do. After all, if they aren’t selling material objects full of features that buyers touch and interact with and admire physically, then what are they selling?